We as Muslims held the belief of the trinity as just one chapter of the book of shirk â€¦The overwhelmingly powerful assertion in the Quran that God is absolutely one rules out any notion that another being could share his sovereignty or nature â€¦..
Christian: God for me and orthodox Christians, three divine persons Father, Son,and Holy Spirit distinctly coexisting in unity as co-equal, co-eternal, and consubstantial , or of one being According to this doctrine, God exists as three persons but is one God, meaning that God the Son and God the Holy Spirit have exactly the same nature or being as God the Father in every way. Whatever attributes and power God the Father has, God the Son and God the Holy Spirit have as well. "Thus, God the Son and God the Holy Spirit are also eternal, omnipresent, omnipotent, infinitely wise, infinitely holy, infinitely loving, and omniscient." god (with small g) means false one,isn't it ? if so trinity isn't 3 gods,according to Islam ... read the following Islamic definition of God to get the clue. What is God, according to Islam? Re: My 2nd study "trinity in the Holy Quran, A muslim - christian dialogue"
Christians don't believe in 3 gods,according to the Quran. but associating with the one true God (the father as they like to call),with 2 non divine entities (Jesus,holy spirit)... it is not (god+god+god) but (God+god+god). second :May I ask you where did you get the idea that there is God and he is manifested to his creation with three ways? you will argue that the bible says so.... and the bible is entirely the word of God ,that it must be telling the whole truth and nothing but the truth in any Metaphysical concept therein. it is a matter of faith ,or would you claim that the supreme being is kept there in a laboratory and proven to be with three manifestations? Christian: we believe the Holy Spirit as one Person of the Triune God, who revealed His Holy Name YHWH to his people Israel, sent His Eternally Begotten Son Jesus to save them, and sent the Holy Spirit to Sanctify and give Life to his Church. He is the Creator Spirit, present before the creation of the universe and through his power everything was made in Jesus Christ..
Christian: What evidence is given to suggest that the Holy Spirit is Gabriel? Muslim : In the Quran, The word appears twenty-one times and has several different usages in the Qur'an with a wide range of meanings. 1- Spirit as Revelation: Holy Quran 42:52 We have thus revealed a Spirit to you [Prophet] by our command: you knew neither the Scripture nor the faith, but We made it a light, guiding with it whoever We will of Our servants. You are indeed guiding to the straight path. Here spirit is an inspiration , brought to life in those whose hearts are dead through ignorance. Christian: It seems that the spirit in the verse is an entity reveals the revelationâ€¦. Muslim: why not the revelation itself? Christian: Holy Quran 16:2 Also 40:15 He sends down the Angels with the Spirit (Ruh) by His command upon whom He wishes of His servants: "That you shall warn that there is no god but I, so be aware of me." The Quran is simply emphasizing the point that it is Allah that commands the Spirit to come down and reveal the inspiration. Muslim: Canâ€™t we say that he sends, by his command, the angels with the revelation upon whom He wishes of His servants? If not, why not? Even if we suggest that the (spirit) mentioned after (commands) not to mean (a revelation), still we can argue that it means (Gabriel) â€¦.. And the meaning would be " He sends down the Angels with Gabriel by His command upon whom He wishes of His servants"â€¦. if not, why not? 2- The Spirit as Gabriel. SAY: The Holy Spirit has brought it down as Truth from your Lord to brace those who believe and as guidance and good news for Muslims. Say:"Whoever is an enemy to Gabriel,then know that He has brought it down for your heart with Godâ€™s permission, to confirm what came before it and as guidance and good news for believers. also ,Quran 26:193 The Faithful Spirit has brought it down into your heart, so that you may be a Warner. 70:4 The angels and the spirit ascend unto him in a Day the measure whereof is fifty thousand years:78:38 on the day when the angels and the Spirit stand arrayed, they speak not, saving him whom the Beneficent alloweth and who speaketh right.97:4The angels and the Spirit descend therein, by the permission of their Lord, with all decrees.19:17 So she took a veil from them; then We sent to her Our spirit, and there appeared to her a well-made man. Christian: I disagree with you and think that the reference all to an entity other than Gabriel... It is stated that Allah used more than one messenger to bring down the Quran: Quran 77:5 By those who bring down the Reminder. According to the Quran, the Reminder refers to the revelation given to the prophets and to Muhammad.Quran 16:2 Also 40:15 He sends down the Angels with the Spirit (Ruh) by His command upon whom He wishes of His servants. Muslim: First: Though the revelation given to Mohamed was called (reminder), Holy Quran 15:6 And they said: "O you upon whom the Reminder has been sent down, you are crazy." not every reminder is synonymous with the reminder revealed to Mohamed (pbuh)â€¦The folk of Noah had their own reminder Holy Quran 7:63 Are you surprised that a Reminder should come to you from your Lord through one of your own men, so He may warn you and you will do your duty, and in order that you may receive mercy?" The folk of Aad had their own reminder as well, Holy Quran7:69 Are you surprised that a Reminder from your Lord should come to you through one of your own men, so that He may warn you?The torah was a reminder too... Holy Quran 21:105 We have written in the Psalms following the Reminder; "My honorable servants shall inherit the earth." Second: Holy Quran 16:2 also 40:15 He sends down the Angels with the Spirit (Ruh) by His command upon whom He wishes of His servants. The angels are sent down to selected servants, not servant â€¦â€¦..Nothing would force the meaning of the verse that a group of angels are sent to each single servant. Third : Even if the meaning that a group of angels are sent to each single servant, we donâ€™t have any clue that Mohamed peace be upon him had it this way â€¦. Both the Quranic verses and the authentic sunnah affirmed that it was a specific Angel who revealed the Quran â€¦â€¦..
With the hundred of hadiths mention the revelation of the Quran, there is not one instance that mention any other entity whether An Angel or whatever, that taught Mohamed peace be upon him the revelation ,the only angel whose name is mentioned with regards to the revelation of the Qurâ€™an is Gabrielâ€¦proving the argument that Allah used more than one messenger to bring down the Quran, is an argument from silence â€¦. Christian: In verses 78:38 On the day when the angels and the Spirit stand arrayed, they speak not, saving him whom the Beneficent alloweth and who speaketh right. and 70:4 The angels and the spirit ascend unto him in a Day the measure whereof is (as) fifty thousand years:, and 97:4 The angels and the Spirit descend therein, by the permission of their Lord, with all decrees. Make a distinction between the angels (of which Gabriel is obviously one) with the Spirit. This supports that Gabriel is not the Spirit. Had the Spirit been Gabriel there would be no need to distinguish him from the angels. Muslim: In Arabic language it is not unusual to specify part of a whole group to emphasize the significance of that part. e.g.. in 55:68 God talks about fruits, dates and pomegranate to emphasize the last two kinds of fruits. [55:68] In them are fruits, date palms, and pomegranate. In 2:238 God talks about Salat and the middle salat to emphasize its significance of the middle salat. 66:4 If the two of you repent to God, then your hearts have listened. But if you band together against him, then God is his ally, and so are Gabriel and the righteous believers. Also, the Angels are his helpers. This verse mentions the Angel Gabriel separately from the other angels, but we know that he is An Angel himslef. 2:98 Whoever is an enemy to Allah and His angels and apostles, to Gabriel and Michael,- Lo! Allah is an enemy to those who reject Faith. This verse mentions the Angel Gabriel and the Angel Michael separately from the other angels, but we know that they are angels themselves. Christian: How do you know that Gabriel is an angel? We have numerous super Authentic Hadiths, tell us, not only who Gabriel is (An Angel) but also lots of other things about him â€¦. Qur'an 15:29 Also 32:6-9 , 38:72 So, when I have made him and have breathed into him of My Spirit, do ye fall down, prostrating yourselves unto him. These passages indicate that after fashioning man God gave him life by breathing his Spirit into himâ€¦.. With the same linguistic structure, in verse 21:91 Mary received the breath of life (life giving spirit) and conceived Jesus: 21:91 "And (remember) her who guarded her chastity: We breathed into her of Our Spirit, and we made her and her son a sign for all peoples." 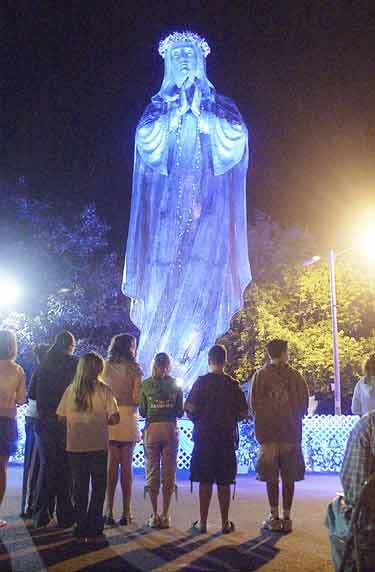 We are also told that Godâ€™s Spirit appeared to Mary in the form of a man: 19:17 she chose to be secluded from them. We sent her Our spirit, who presented himself to her as a full-grown human being. Muslim: Only a dogmatic and close minded who would consider every mention in the Quran, of the word spirit (Ruh) ,has to be the holy spirit, or all the instances the word spirit mentioned, has to be typically in meaning â€¦. "In its role as conveyor of revelation, the spirit is identified as Gabriel (q.v. ; Jibrīl, q 2:97). In Maryâ€™s story, the spirit is the life-creating force of, or from, God. Qurānic commentary, however, has consistently differentiated between â€œour spirit sent to Mary in the form of a well proportioned manâ€ (q 19:17) and â€œour spirit [of ] which we breathed into Maryâ€ (q 21:91; 66:12), identifying the former with the angel Gabriel and the latter with the life substance with which God (directly) awakened Adam to life from clay, just as it (directly) awakened Jesus to life in Maryâ€™s womb . The classical interpreters established that Gabriel was a mean, or instrument, of Godâ€™s creative power, whence they linked his agency with Godâ€™s breathing, or blowing, of his spirit into Mary by developing the theme of Gabrielâ€™s blowing at Maryâ€™s garment or person ." Second: Assuming the spirit to be some other entity than Gabriel, still it has to be a created entity â€¦â€¦The idea of the divine to be manifested in the flesh is clearly condemned in the Quran â€¦ The idea of a created messenger from God that took the human form goes very well with the idea " that is mentioned in Quran and sunna" of Angels, especially Gabriel, taking the human form in earthly mission "â€¦. -Jesus is called a spirit in the Quran ,yet we know that he is a creature ,according to the Quran. "Muslims assert, â€œThe suggestion that God is a spirit implies He is a created being, like an angel.â€ Undeniably, Islam says that God is not a spirit; otherwise, one would imply he is part of the created realm, like the angels. On the Contrary, the Bible says that God is Spirit (Jn 4:24; Is 31:3). " - Evidently, â€œThe Muslimâ€™s concept of God conflicts with the deity and personality of the Holy Spirit (1) the concept of the absolute unity of God precludes the possibility of the Holy Spirit being God. (2) The personality of the Holy Spirit, and indeed the possibility of knowing God in a personal way through the indwelling Holy Spirit, is incompatible with the Muslimâ€™s concept of Allah's absolute transcendence.â€ â€œSince man is a servant (â€˜abd) of Allah, he does not look for a close communion with God through the Spirit of adoption. The very idea of the Spirit indwelling the believer is incompatible with Islamic ideologyâ€. â€œOnly the Sufis (mystics) aim at union with God, but for them this is achieved by manâ€™s striving upward and not by the coming down of the Holy Spirit to dwell in their hearts.â€ The holy spirit in the Qur'an : an assessment from a Christian perspective. By Judy Tao Shih-Ching. 2-Even if we ignore the narrations , the verse simply mentions the spirit(which has varied meanings) without revealing anything about its nature.So what are you looking for? If the spirit is God ,God could have revealed that in the verse (or other verses)in simple clear words. The opposite is true ,we have several hints affirming the spirit as a creature..
C. The spirit can take the human form: "Then We sent unto her (Mary) Our spirit and it assumed for her the likeness of a well built man. Holy Quran 19:18She said: Lo! I seek refuge in the Beneficent One from thee, if thou art God-fearing. He said: I am only a Messenger of thy Lord, that I may bestow on thee a faultless son. The incarnation for an earthly mission and be called a messenger fits perfectly with the angels. Holy Qur'an 6:9 And (even] if We had appointed an angel as Our message-bearer, We would certainly have made him [appear as] a man . E- In the Qur'an ,Jesus is described as a spirit from Allah ,yet we know that he is created, not divine by any sense ,according to the Qur'an. Christian: In verse 58:22:" He has written Faith in their hearts, and strengthened them with a spirit from Himself. And He will admit them to Gardens beneath which Rivers flow, to dwell therein (forever). In order for the Spirit to be able to strengthen believers everywhere implies that the Spirit is omnipresent. Yet only God is omnipresent which essentially means that the Spirit is God. Mary, belong to the Trinity? Christian: what about the understanding that the trinity that the Quran is concerned about is , father, son, marry? quran 5:119, reads: â€œAnd behold! God will say: â€œO Jesus the son of Mary! Didst thou say unto men, â€œWorship me and my mother as gods instead of Godâ€? He will say: â€œGlory to thee! Never could I say what I had no right (to say). Holy Quran 27:55 "You are taking the men out of lust instead of the women! No, you are an ignorant people!" Holy Quran 27:24 I found her and her folk prostrating herself to the sunâ€”instead of Godâ€”and Satan made to appear pleasing to them their actions and barred them from the way so they are not truly guided. It seems that those folk could have thought the sun as God . Holy Quran 39:38 If you should ask them who created Heaven and Earth, they would say: "God." SAY: "Have you (all) ever seen what you appeal to instead of God [Alone]? If God wanted [to cause] me any trouble, would such females ever remove His trouble? Or if He wants some mercy for me, will such females hold back His mercy?" SAY: "God is [the Means] by Which I reckon; on Him do the reliant rely." Holy Quran 10:18 They worship, instead of Allah, what can neither harm them nor help them, saying, Â´These are our intercessors with Allah.Â´ Say: Â´Would you inform Allah of something about which He does not know either in the heavens or on the earth?Â´ May He be glorified and exalted above what they associate with Him! Holy Quran 39:43 Or do they adopt intercessors instead of God? SAY: "Even though they do not control a thing and cannot even reason?" we note that the previous objects of worship are (1) called gods . (2) their worshipers didn't believe in them as God the creator ,they just intercede. Holy Quran 9:31 They have taken their learned men and their monks for their lords instead of God. So have they taken the Messiah, son of Mary, although they were commanded to worship only the One God. There is no deity but He. He is far above whatever they set up as His partners! Have you seen,what the verse saying ? 1- your intentions should be consistent with your actions that counts ,it is not what you think you are doing but what you REALLY do. Holy Quran 5:116 And as Allah said, "O Isa son of Maryam, (Jesus son of Mary) did you say to mankind, "Take me and my mother to your selves as two gods, apart fromAllah '?" He said, All Extolment be to You! In no way is it for me to say what I have no right to. The verse is just one example of, the thought to be divine(Jesus) and the thought to be not divine yet could be intercessor and be venerated (Mary),be taken as gods ..
Holy Quran 3:64 SAY: "People of the Book, [let us] rally to a common formula to be binding on both us and you, that we shall worship only God [Alone] a associate nothing else with Him, nor shall any of us take on others as lords instead of God." If they should turn away, then say: "Bear witness that we are Muslims." Christian: what about the Quran mention of Jesus and Mary eating food? I'm sorry but your arguments make a number of assumptions and liberal interpretations to reach your desired conclusions. First, you make the assumption that the argument the Koran is putting forward is that since Mary and Jesus eat food, neither is God. Therefore, the Koran believes Mary is part of the Trinity. However, the argument could be easily construed, since Mary and Jesus ate food, both are nothing but plain humans. This doesn't imply that Mary was part of the trinity Godhead in the Koranic view, but merely that in the Koranic view Christians viewed her as something aside from another plain human being. As is described in the article itself, some Christian sects truly worshiped her and the Church itself put her forth as Godbearer, which is more than just another human being. Indeed, Catholics continue to address prayers to her, an act that would be considered shirk in Islam (i.e., associating others with God). Hence, the Koranic argument need not be interpreted as anything more than that Jesus and Mary are both human beings. Christian: where is in the Qur'an the holy spirit isnâ€™t God and how do you explain nowhere in the Quran the worship of the holy spirit is condemned? By saying the holy spirit is Gabriel ,created is negating the divinity, isnâ€™t it? How many images, idols are those of Mary and Jesus is bowed to, prayed to ,asked for help and mercy compared to those of the holy spiritâ€¦. "Lord Jesus Christ, Son of God, have mercy on me, a sinner. Lord Jesus help me protect me save me etc......"
or let's listen to the common prayers of the world's largest Christian church, with over a billion members. "Most Holy Virgin Mary, Help of Christian,how sweet it is to come to your feet imploring your perpetual help.If earthly mothers cease not to remember their children,how can you, the most loving of all mothers forget me?Grant then to me, I implore you, your perpetual help in all my necessities, in every sorrow, and especially in all my temptations.I ask for your unceasing help for all who are now suffering.Help the weak, cure the sick, convert sinners.Grant through your intercessions many vocations to the religious life. Obtain for us, O Mary, Help of Christians,that having invoked you on earth we may love and eternally thank you in heaven." "Holy Mary,help those in need,give strength to the weak,comfort the sorrowful,pray for God's people,assist the clergy,intercede for religious.Mary all who seek your help experience your unfailing protection.Amen." Quote from: Roman Catholic Mary Worship by the evangelical minister John MacArthur Jr. 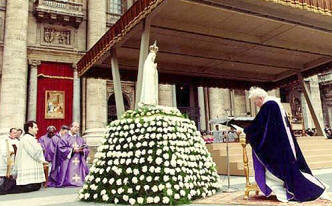 The Roman Catholic view of Mary is pagan, it is utterly pagan. To this day the worship of Mary is one of the principal points of separation between the Graeco-Roman Catholicism and Evangelical Protestantism. 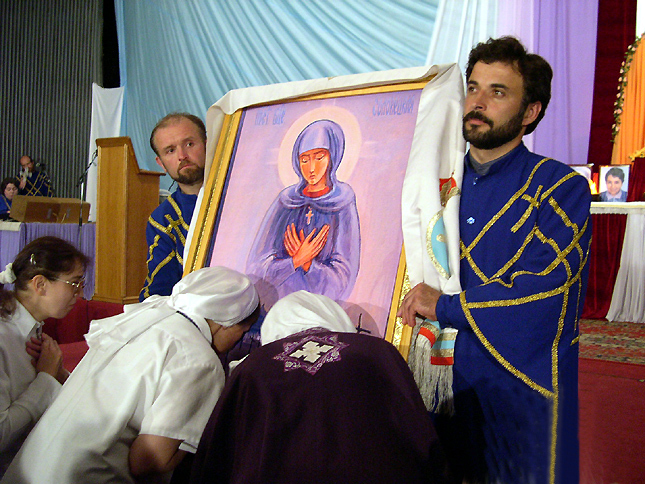 the veneration of Mary gradually degenerated into the worship of Mary; and this took so deep hold upon the popular religious life in the Middle Age, that, in spite of all scholastic distinctions between latria, and dulia, and hyrerdulia, Mariolatry practically prevailed over the worship of Christ. ..The popular religious want had accustomed itself even to female deities, and very naturally betook itself first of all to Mary, the highly favored and blessed mother of the divine-human Redeemer, as the worthiest object of adoration. 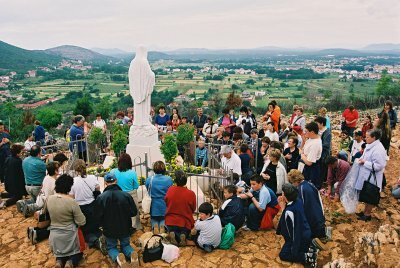 This mythical and fantastic, and, we must add, almost pagan and idolatrous Mariology impressed itself on the public cultus in a series of festivals, celebrating the most important facts and fictions of the life of the Virgin, and in some degree running parallel with the festivals of the birth, resurrection, and ascension of Christ. Quote from: Roman Catholicism, Mary, and Idolatry ,by Matt Slick, President and Founder of the Christian Apologetics and Research Ministry. 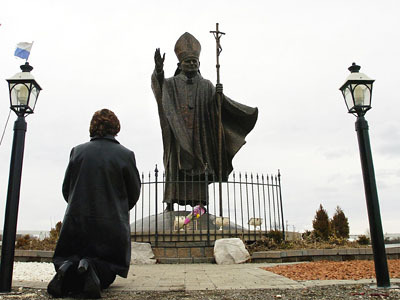 Does the Roman Catholic Church promote idolatry? According to the scripture and its own practices, yes it does. "Therefore, my beloved, flee from idolatry," (1 Cor. 10:14). It has been said that actions speak louder than words. And while the average Catholic may tell you that they do not worship the Mother Mary, their actions say something quite different. Let's examine the danger in this. 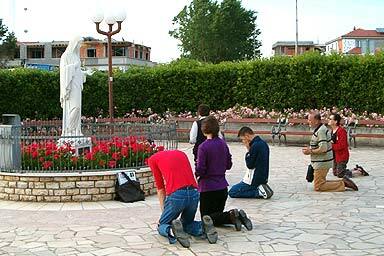 THE most popular form of idolatry that ever captivated the human heart is the worship of Mary. To the unwedded priest of contemplative mind, Mary has every beauty, every charm, every divine grace. Pure enough to be the chosen mother of that human body in which Deity dwelt, unapproached in her unparalleled honors, chaste as the unspotted snow; she is the queen of his imagination, the ravishing idol of his heart. And as the mistress of his affections, he sings her praises, proclaims her glories, and gives her glowing homage. Those who fail to worship Mary, in his sight, are destitute of moral taste and perception; they are blind to beauty; they are governed by heartless ingratitude; they have no ear for the sweetest voice that ever fell on the ears of angels, or sent its thrilling melodies through the wounds of a bleeding heart. 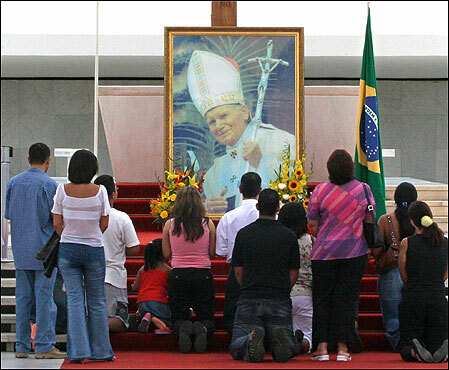 Wherever Roman Catholics are found, you will find the practice of rank idolatry. The worship of Mary is one part of this unscriptural practice. 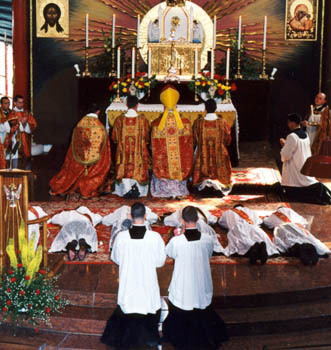 If you are not persuaded that Catholicism encourages and even requires a level of â€œdevotionâ€ to Mary that really is a form of worship, then I challenge you to ask God what He thinks about it. While Catholics believe they are venerating the Virgin Mary and Divine Child Jesus in the Biblical tradition, the evidence is overwhelming that they are really continuing the Egyptian and Babylonian pagan tradition of worshipping the Sun Goddess and her Divine Son. Once more, Roman Catholicism is shown to be counterfeit Christianity on the surface but Sun God paganism throughout underneath!